Human Population Increase – How Are We Doing? Population is a critically important variable in the quest for a sustainable and healthy world. Population dynamics of natural populations is relatively well-understood. Introducing an exotic species into a new habitat where it faces little competition and has rich resources results in a steeply rising curve usually with pronounced exponential rates of increase. 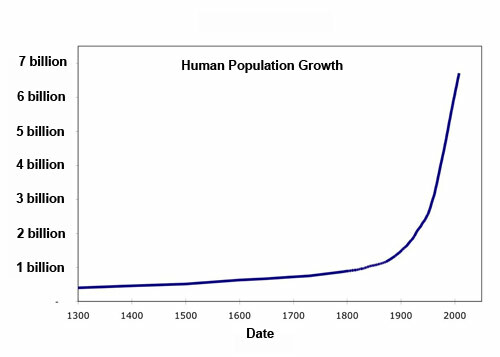 Here is the curve for human population increase (I used world bank and UN data) which looks more-or-less identical to a normal natural population of an introduced species with little competition and rich resources. Over time the resource level and/or competitive factors or disease from overly dense populations begin to tip the curve so that the slope of population increase is decreased. 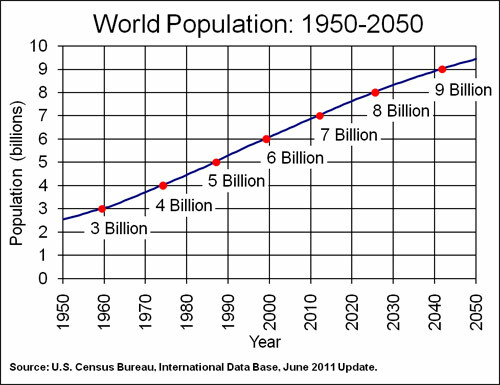 Here is a chart of the recent changes in human population growth and a projection to 2050. There is a gentle inflection somewhere about 5 billion people. 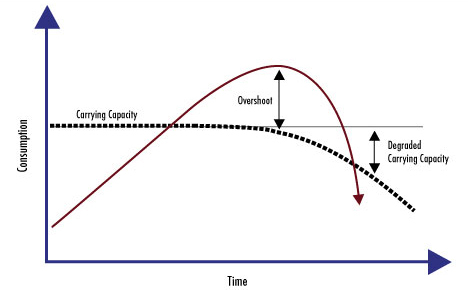 In the normal course of events in a natural population, there is an “overshoot” beyond the natural inflection point that rises to an amount that depends on a wide range of factors. The inflection point is essentially where the population just begins to react to declining resources, or increased competition, or disease. It can be a large or a small overshoot. However, the normal pre-existing carrying capacity of an area is roughly equal to where the inflection point occurs. As the pressures on the population increase, the curve slows down completely and then begins to tip over and head into a declining population. The population decline has been caused by stress on the resources and/or increased competition, and disease. This stress normally damages the resource base which lowers the previous carrying capacity of the area. Depending on the severity of the overshoot, the damage to the resources will be roughly proportional. In some cases the damage is so great that the population can never recover. If the damage is not too severe, the species will recover to the lower carrying capacity. Often it takes a number of such overshoots, crashes, and recoveries to reach a relatively stable equilibrium. At least in terms of fit to the natural population curves, humans are not demonstrating anything other than being particularly adept at using up resources through consumption, waste, pollution, and failure to recycle. Global warming will of course put further stress on resource levels and existing coastal regions where population is high. On the above graph, humans (we) are just over the carrying capacity for comfortable living. The potential for severe overshoot is very real. According to the Global Footprint Network, humanity uses the equivalent of 1.5 planets to provide the resources we use and absorb our waste annually. This means it now takes the Earth one year and six months to regenerate what we use in a year. Moderate UN scenarios suggest that if current population and consumption trends continue, by the 2030s, we will need the equivalent of two Earths to support us. And of course, we only have one planet. Needless to say, if the overshoot is allowed to reach dramatic levels, the inevitable decline will be a horrible experience for billions of people. Suggested estimates of 11 to 14 billion have been made by demographers. Such levels would be very uncomfortable for most people. If this were the case and the decline were to begin, it would be devastating. People certainly have the potential to be smart about the ecological management of the world. The science is not lacking in this field. Competent management would absolutely not call for continued increase in population levels. Population growth however, is encouraged in many countries by offering tax breaks for children, rewards for more than two children, and baby bonuses. Countries that desire increased populations tend to deny education to women and discourage family planning or birth control. Economic growth is politically and corporately seen to be necessary. One way to achieve economic growth is to increase the demand – have more babies. This is not true of all countries of course and many discourage having too many babies. The net result today is that population continues to increase, but at a slightly slower pace than previously. In a few cases the actual fertility rate is lower than the replacement rate. China has experimented with coercive population control with some success accompanied by much unhappiness and a degree of cheating the system. One disturbing trend is aborting female children in favour of male children, such that the country now has a potential problem of many young men (30 million by 2030) who will not have a potential mate. We need to find and implement a wide range of non-coercive means of introducing human population management. Stabilizing or reducing absolute population size will make solving other problems easier both because there are fewer of us and also because many of the solutions to birth control involve education which spills over into other relevant topics. The conservative predictions for population growth by the time kids today are in their mid-40s is about 9 billion people on this planet. This will place the human global footprint at just about 2.0 – that is we will have overshot our planet’s ability to renew the resources we have used in one year by a factor of two. For developed countries this is much greater (the US today is at about a factor of 10 on a per capita basis if US lifestyle were extended to the entire world population). If the prediction of growth to 2100 is maintained, it could be 11 billion people. If we consider the implications of a planetary carrying capacity of 5 billion people that means the population must fall at some point to 5 billion people or fewer to be sustainable – recognizing that the resource base of the planet will be considerably diminished by then and developing countries will want to experience improved lifestyles. Unless we drastically change our reproductive patterns, demographers predict that the peak will be about 11 billion people by approximately the year 2100. That will mean the time from inflection on the growth curve to peak population will be about 110 years. The declining side of the growth curve is usually pretty symmetrical to the increase implying that the rate of decline in population will be roughly equal to the negative of the rate of increase. So by 2200 the population will diminish to about 5 million people. That cannot happen without misery. responsibility for the environmental disasters that have been caused by lack of waste management and recycling. recycle and reuse. The older cabinets and stands have great depth to accommodate the deep body of the electronic component.